Blackberries are in season - but if you're not lucky enough to have them where you live, you can definitely use frozen as well. They hold up fairly well when you thaw them - just let them rest on some paper towels to catch some of the juice, and you'll be fine. The idea for this salad comes from Christer Lingstrom's book Den Goda Sommaren. ("The Good Summer".) And this is good indeed. Really, really good! The salty serrano ham (any dry-cured ham will do) goes so well with the sweet berries, and the bite of the spicy rocket is just perfect. I urge you to try this one! Start with the dressing. Purée the berries and pass them through a sieve. Mix with olive oil, honey and vinegar, and season with salt and pepper. It's good to do this about an hour ahead, so the flavors will have plenty of time to bond. 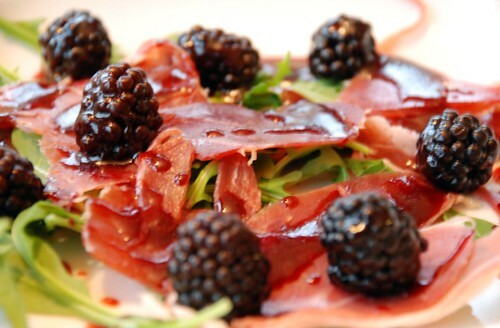 Arrange salad, ham and blackberries on four plates, and drizzle with the dressing. Serve with a great bread, and you're all set! Apparently, it's the season for fruit and ham - I've just posted a nectarine and prosciutto starter :) It is such a winning combination though. Your beautiful pic has reminded me that I don't think I eat nearly enough fresh blackberries. May have to rectify that with this salad - thanks for the inspiration. I think this recipe is genious in the flavour combinations. The honey and balsamic vinegar in the dressing will round out the tartness and saltiness of the ham. Wonderful post Anne!! This salad sounds amazing. The dressing sounds like it would also be really nice on other types of salads. Wow, good recipe. Hope the salad tastes as good as it seems to. Gonna try it out.